Just going to classes or doing an online course isn't enough if you want to improve your English. Although both are important, it's what you do outside of them that makes the difference on how quickly you improve your level of the language. If you really want to improve your English, you need to regularly read in English. If you are an English teacher, click here to learn about the teacher version of this eBook. The problem is that for even somebody with your level of English, finding things that are suitable for your level isn't very easy. The reason is that people with your level of English are in a difficult position. Most of the articles you'll find on the web which are for improving English will be too easy for you, too short or boring. And the pieces of writing meant for native speakers will be just a little too difficult and confusing for your level. This is what my students who have an upper-intermediate or are studying for the Cambridge Certificate of Advanced English (CAE) exam experienced. They wanted to read in English, but couldn't easily find material themselves. The result was that most of them just gave up looking and didn't read things in English. And who could blame them: If I were in their position, I would do the same. To solve this problem for own my students, I decided to make my own material for them to read outside of class. Articles and pieces of writing which didn't confuse or frustrate them, but were still challenging enough that they were still improving their level of English when reading them. Articles which were both interesting to read and on a variety of topics which would help them to broaden their knowledge of English vocabulary. It's taken me over 2 years to create all of this reading material and to get it just right. And the result of all this hard work is this eBook. In addition to this, you'll also find in the eBook a tried and tested method for using these reading exercises to improve your English quicker. The material in the eBook will last you for over 6 months of regular reading. 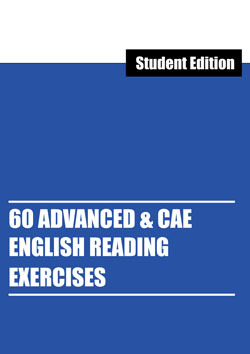 Each reading exercise has a text that been specifically written and adapted (so they are still challenging, but not difficult for you to read and understand) for people whose level of English is upper-intermediate or are studying for the Cambridge CAE/Advanced exam. The texts cover a wide range of different topics (from science to art and everything in between) and this will broaden your knowledge of English vocabulary. In addition to the text, each reading exercise contains a vocabulary exercise. In this, you will learn the meaning of 7 carefully selected phrases and words from the text. These are words and phrases which I have noticed over the 10 years that I have been teaching English that students at your level commonly don't know, don't use or use incorrectly. It would be pointless for you to learn the meaning of these words and phrases and then forget what they mean. To ensure you remember them, each reading exercise comes with a page for you to write a sentence in your own words for each of the 7 words and phrases you learnt in the vocabulary exercise. The cost for all of this material is €12 (around $14). When you take into consideration how long it will take you read all the material (over 6 months) and how much it will help you improve your English, it is cheap for the price. I've been giving my own students these reading exercises for three years now and I'm very happy with the results I've seen. Not only with seeing how it has improved their level of English, but seeing how much they enjoy the topics of the reading exercises that they always want to talk about what they've read in class. Click the button below to buy your copy.